Whether it is in breakfast, lunch or dinner, paratha is always the best item to have. Now, when it comes to Paneer Paratha, it is one of the popular and all time favourite paratha from various dishes of Punjab. There are several other types of Parathas that you can easily make at home for your breakfast, lunch or dinner like Aloo Paratha, Methi Paratha, Onion Paratha, Lauki Paratha etc. 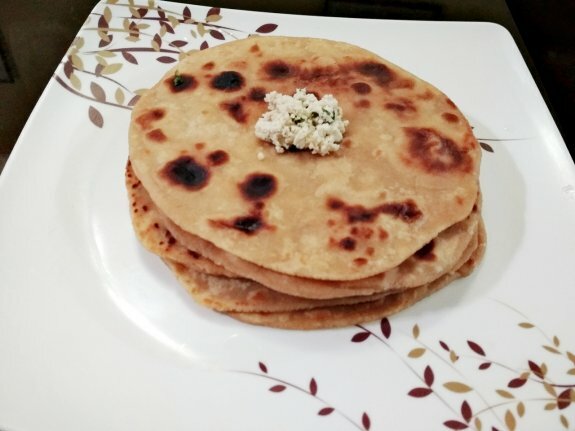 Here in this Paneer Paratha, I am using homemade paneer or cottage cheese so that the parathas can be soft and my family can get the fresh paneer. 1. Take 2 ½ Cups of Whole wheat flour, salt and oil in a big bowl. Mix everything well. 2. Pour water and start to knead. Add more water if required and knead soft smooth dough. 3. Cover the dough with wet cloth and rest it for 15-20 mins. 1. Take a big bowl and add 200 grams fresh paneer or cottage cheese, chopped green chillies, Garam Masala powder, dry mango powder, red chilli powder and salt. 2. Mix everything well so that all the spice powders will mix properly with this grated paneer. 1. Take out a medium size ball from the dough. Make a small hole on the middle of the ball. 2. Now, place the paneer stuffing one the hole of the ball. Now, take all the edges of the ball in one point and press gently and tightly so that the paneer stuff will properly go into the ball and will not come out. 3. Dust some flour on the stuffed ball. 4. With the help of rolling pin or belan, roll the ball to give it a circle of about 6 to 7 inches diameter. 5. Heat tawa and place the rolled paratha on it and roast one side. 6. Now, flip the other side when one side is partly cooked. 7. Apply oil with a spoon on the side of the paratha. 8. Turn over again and flip. 9. Let the paratha cooked from both sides. 10. Flip once or twice and spread oil on the sides of the paratha if required. 11. Make the rest of all the paneer parathas in this way and keep them in the casserole so that all parathas will be hot. Serve this panner paratha either with cream mint chutney, raw mango chutney, green chilli chutney, Raita, Aachar or pickles etc.